Greetings, Stampers and a Happy Father's Day to all the dads out there! Since today is Sunday you know what that means, another challenge from The Paper Players! 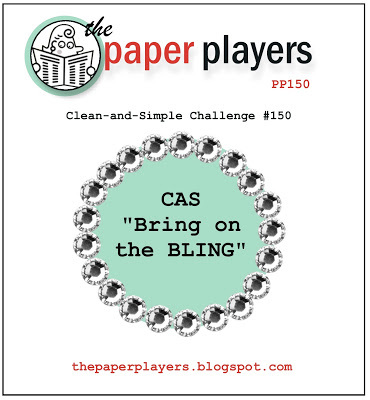 This week Anne Marie has a clean and simple challenge for us, "Bring on the Bling". So gather up your rhinestones and glitter and get ready to play along! 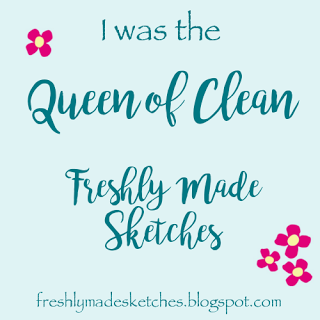 Hmm, so how can you load on the bling while staying clean and simple? Not so easy, Anne Marie, but then again that's why these are called challenges! I decided that I would keep it simple by focusing on one key element and keeping the color scheme monochromatic. 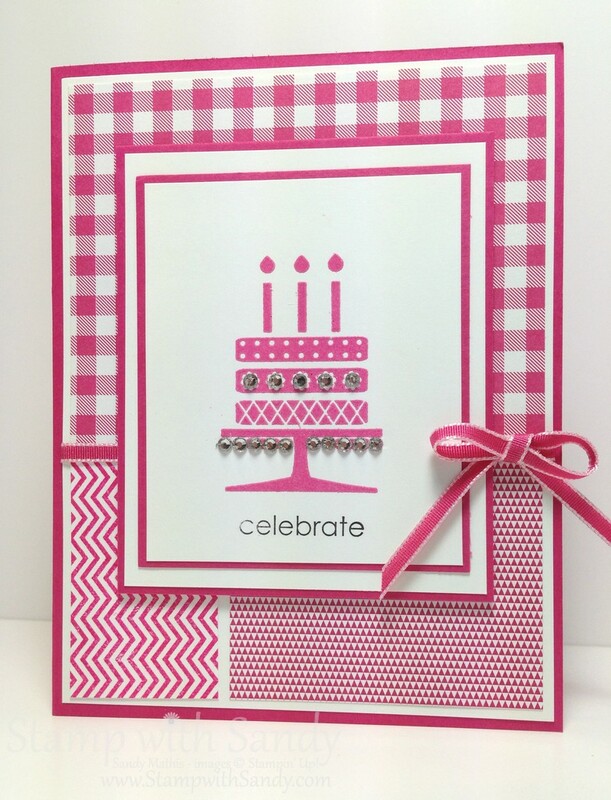 Melon Mambo is the featured color and the stamp set is Embellished Events, a set perfect for adding any kind of embellishment to, especially rhinestones. I went in search of a layout for my project and the one at Seize the Birthday was perfect. 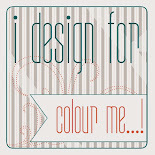 For the background, I used two patterns of DSP from the Gingham Garden pack. I needed a third to use this layout and didn't have one. So I made my own using the background stamp from the Oh Hello stamp set. For a little added shine, I stamped the birthday cake in Versamark ink and heat embossed it with Melon Mambo Embossing Powder. The greeting was stamped in Basic Black, then all that was left to do was to load on the rhinestones. 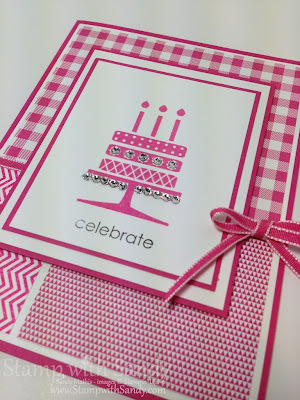 I love Stampin' Up rhinestones, they are so super sparkly! Thanks for paying me a visit today! Inky hugs! 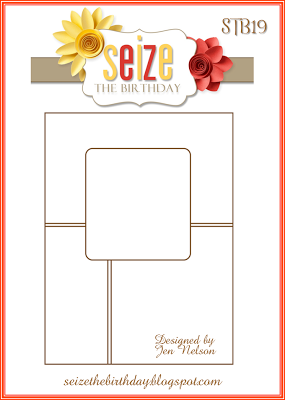 What an adorable birthday card, Sandy! This layout is perfect for showcasing this paper! 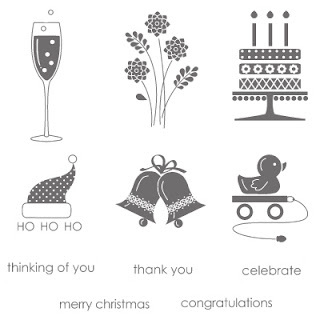 I love the clean, crisp lines on this card, and the mix of monochromatic papers. A beauty! 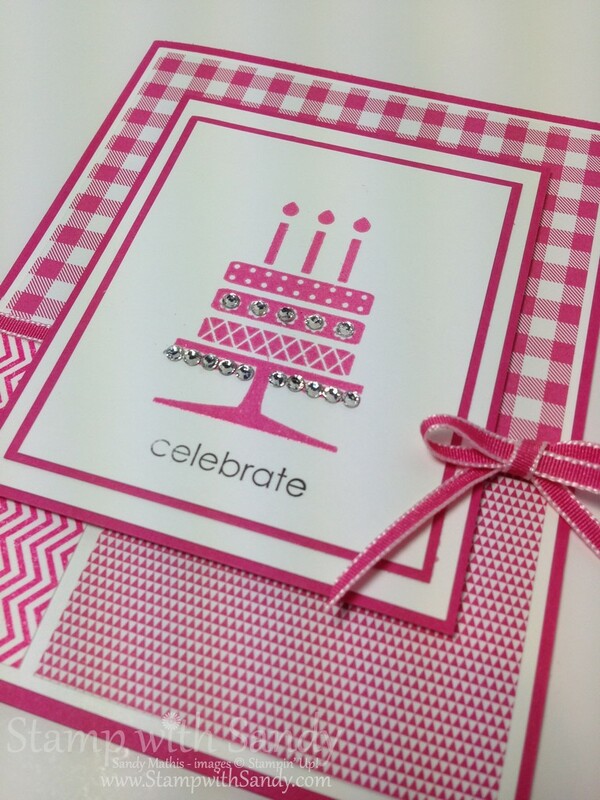 Sandy, This is such a beautiful, bright, cheery card - perfect for a birthday celebration. The paper is perfectly displayed here, and the bling takes center stage. I LOVE this....into my faves it goes! 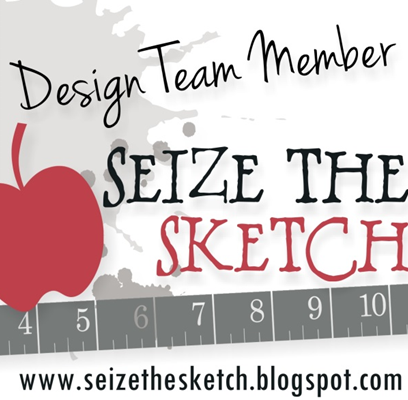 I don't have this set, but I love the monochromatic theme (especially those papers) and that sketch works perfectly!